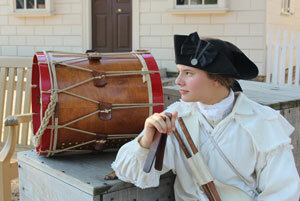 Colonial Williamsburg Fifes & Drums Senior Corps member, Clare Provoncha displays Whamdiddle Flat Cocobolo Bones in Historic Area of Colonial Williamsburg. Check out our growing collection of Whamdiddle Flat Bones. They are great for women, kids and players with small hands (and large hands too). 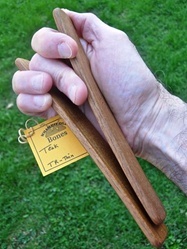 Make no mistake about it, Whamdiddle Flat bones are curved. Yes, these bones definitely sport a curved arc. The face (i.e. striking surface) is what's flat. That's why they're called flat bones. Flat bones with no curve are called plank bones. Plank bones are literally flat as a board. But Whamdiddle Flat bones are curved. If you cut a flat bone across the width and look at the profile, you will see the shape is rectangular. By comparison, Minstrel Style Bones are oval. Flat style bones are popular because they fit any size hand and deliver a remarkably dynamic range of tones.